On March 8, 2016, Highland Park’s junior varsity hockey team scrimmaged against the GLASA (Great Lakes Adaptive Sports Association) Falcons in their annual comingled sled hockey contest at Centennial Ice Arena. It’s always better to give than to receive during the holiday season, but the Highland Park varsity and JV hockey teams found a way to do both. 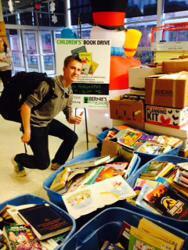 The two teams partnered with Bernie’s Book Bank of Lake Bluff to raise more than 2,500 books for children during their December 2015 holiday book drive at Highland Park High School. The original goal was to collect 500 books, so the many clients served by Bernie’s Book Bank were the beneficiary of the campaign’s success. Bernie's Book Bank facilitates the collection, processing and redistribution of new and gently used children's books to significantly increase book ownership among at-risk infants, toddlers and school-age children throughout Chicagoland. To learn more about Bernie's Book Bank, visit http://berniesbookbank.org. The Highland Park Giants Hockey Association has been a longtime supporter of the Save A Star Drug Awareness Foundation. 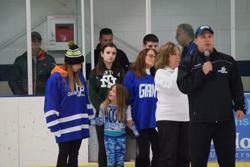 Each year, the Giants host a drug awareness and fundraising hockey game at Centennial Ice Arena in Highland Park. The organization's mission includes educating the public about the dangers and consequences of experimenting with and using drugs, particularly prescription drugs, for non-medical reasons. Save A Star also provides tangible methods to remove unwanted and unused medications from our homes. To date, drug collection boxes have been installed in 37 police departments. The foundation was established by the family and friends of former Giants hockey player and Highland Park High School graduate Daniel Lee Katz, who died from a prescription drug overdose in 2007. Later that year, the Highland Park Giants Hockey Association hosted the first Save A Star benefit game and tribute to Daniel. To learn more about the Save A Star Drug Awareness Foundation, visit http://www.saveastar.org. On March 12, 2015, the Highland Park Giants hosted the GLASA Falcons sled hockey team at Centennial Ice Arena in a comingled scrimmage. The competition was fierce and exciting to the end for both the players and fans. The "Away" team pulled its goalie in the final minute for an opportunity to tie the game. While they had their chances, they just couldn't put the puck in the net. But no matter which team you played or rooted for, it was a fun night for all. GLASA (Great Lakes Adaptive Sports Assocation) is a non-profit organization providing integrative Paralympic, recreational and competitive sport activities for youth, teens and adults who have primary physical or visual disabilities. To learn more about GLASA, contact www.glasa.org. ©2019 Highland Park Giants / SportsEngine. All Rights Reserved.